our new lifelike Christmas trees. All your favorite colors are here. Sturdy center pole for extra stability. Premium quality material for long lasting beauty. Hinged branches guarantee a perfect tree season after season.. Heavy metal hinges keep branches in place, no matter how many ornaments. Metal tree stand keeps tree firmly rooted to the ground. From box to tree in 10 minutes. Bottom section of tree inserts into tree stand. Hinged branches unfold like an umbrella. Repeat with additional sections. Top section inserts into center pole. You are now ready to decorate your new Christmas tree! Injection molded 3-dimensional needles for a lifelike appearance. High quality PVC needles as filler to provide body and density. Premium faux snow on flocked trees stays on season after season. Ready shape branches on select trees for extra fast set up. Commercial grade, UL-approved LED lights. 90% less energy consumption saves you money. 10x longer lasting light technology - never change a bulb. Our trees never go dark - when one light goes out, the rest stay lit. Cool to the touch even after nonstop use - perfect for public displays. Professionally strung lights are generously and evenly distributed. Warm white light provides brilliant radiance with a soft glow. Available from 3.5' to 14' tall. Wide selection of light configurations or opt for unlit. Inspired by natural fir and pine trees from around the world. Choose from different base widths - full, medium, slim/pencil profile. 10 year construction + 3 year light manufacturer's warranty. Worldwide shipping via freight forwarder and common carrier. Tracking info lets you know when to expect your tree. Need help or have questions? Email or call our tree experts. Guided by over four decades of experience helping our customers decorate their homes for the holidays, Santa's Quarters™ is the premier provider of realistic artificial Christmas trees in the US. In our efforts to strive for outstanding product quality, we have introduced cutting edge innovations in the development of artificial trees that satisfy even our most discerning customers. Santa's Quarters™ trees are made with great care and of the finest materials available, guaranteeing a life time of joy and beauty. For utmost convenience, they are all equipped with a sturdy metal stand and hinged branches as well as a center pole construction with multiple sections to make assembly and take down a snap. All trees are delivered to you in a robust heavy duty cardboard box, which can conveniently be used for storage, protecting your tree from dust and sunlight and ensuring that it stays beautiful for many years. Which type of Christmas tree is best? There is no such thing as a single best artificial Christmas tree, as each customer will have different requirements, likes, and dislikes. 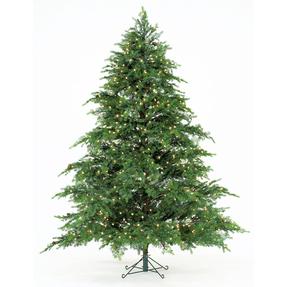 Some customers will have space for a 12' tree, but others may only have space for a 7.5' or even a 4.5' tree. The same goes for the base width and profile (full or slim). 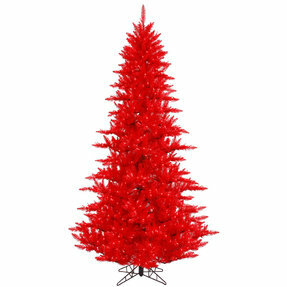 Additionally, some customers prefer an artificial Christmas tree with lights, and some unlit, some prefer different shades of green, some frosted, some flocked, and some colored. The best way to find the perfect tree for you is to determine what size tree you want, what base width, if you'd like it green, or with frosting, flocking, or colored branches. Once you know what size and style of tree you'd like, then check out the category of trees that best matches what you're looking for. Find the tree that you think looks best, and that will be the best type of tree for you. What is a good tip count for a Christmas tree? We would not recommend using tip counts to determine the quality of an artificial Christmas tree for a number of reasons. First, trees with wider tips can have a lower tip count than trees with narrow tips, but still appear more dense and full. Second, trees with different levels of layering and density will appeal to different customers, having totally different tip counts. Instead of looking at tip counts, to determine if a tree is dense or full enough, we would recommend looking at the picture to see if you like how the tree looks. The look of the tree is most important, rather than the tip count. How many lights should be on a pre lit Christmas tree? There is no standard for the number of lights that should be on a tree. Pre lit trees of the same height with a larger base width and longer branches will tend to have more lights than a tree with a shorter base width and shorter branches, for example. Some customers prefer more lights and some less, and additionally, if a tree has larger bulbs it would need less lights compared to a tree with smaller bulbs to produce the same amount of light. Our artificial Christmas trees with lights tend to have more bulbs than a customer would use to decorate an unlit tree themselves, because our trees are professionally strung and the lights go along the branches and not just over them. Our Christmas Light Calculator™ will give you the ideal average number of lights to use in your own decorating, but most of our pre lit trees have a larger number of lights than our tool recommends due to the way they are strung. The best way to determine if a tree has enough lights for you is to look at the picture of the tree on our website, since you can see the lights visible in the pictures. Looking for the most realistic artificial Christmas tree possible? Our line of premium trees includes the latest generation of trees featuring Instant Shape Technology with Memory Wire, ensuring a perfect looking tree every time you take it out of the box, without the need to reshape the tips. This revolutionary technology delivers instantly beautiful results and lets you focus on decorating the tree rather than setting it up. Modeled after natural evergreen foliage, our premium trees feature three-dimensional needles that are so life-like, they are almost indistinguishable from real foliage. This breathtaking effect is achieved through a painstaking and labor intensive process of first creating a mold of an entire branch, including every single needle, and then injecting the mold with molten plastic. Two-tone painted tips in rich shades ranging from the dark emerald of majestic spruce trees to the light green of new growth enhance the incredibly realistic appearance of our luxurious premium Christmas trees. The exquisite look of these trees is further complemented by stunning profiles, suiting a range of space requirements and offering endless decorating possibilities. 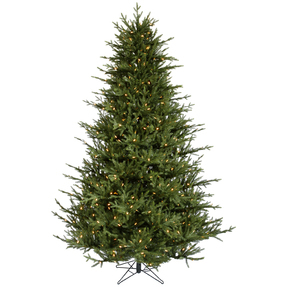 Looking for the best deals on artificial Christmas trees? We are delighted to offer a wide range of traditional trees to suit all budgets. We understand that Christmas is a special time for families, and we take great joy in helping you fulfill the wish for a beautiful Christmas tree, which is why every year we put together a new collection of traditional trees with numerous sizes, profiles, looks, and light configurations to choose from. Through long standing relationships and careful negotiations with our suppliers, we are able to offer you these collections at unbeatable prices without skimping on quality. At Santa's Quarters™, nothing is more important to us than our customers' trust and peace of mind. Like all of our trees, our traditional trees come with a 10-year manufacturer's warranty and depending on the light configuration with an additional light warranty. Want More Than Just A Green Tree? Beyond our extensive collections of premium and traditional trees, Santa's Quarters™ carries an impressive selection of trees for customers with specific design considerations, including stunning frosted trees and flocked artificial Christmas trees that transform any living room into a white winter wonderland in just a few minutes. Rugged alpine trees, colored Christmas trees in the latest trendy shades, as well as festive potted tress and topiaries round out our extensive assortment. Decades of experience in selecting and delivering extraordinary giant artificial Christmas trees have garnered us the trust of the world's most exclusive names in fashion, retail, and hospitality along with governments and cities nationally and internationally, such as the Ritz-Carlton Hotel Company, Six Flags, Marc Jacobs, and Ralph Lauren. Santa's Quarters™ giant trees have graced numerous private and public spaces, from upscale hotels to intimate bed and breakfasts, resorts, shopping malls, boutiques, airports, churches, to city centers and military bases. Our giant Christmas trees are cleverly constructed around heavy duty concentric metal steel rings, and are outfitted with thick, life-like foliage that provides the perfect canvas for endless decorating possibilities. All giant trees come with a generous 1o year manufacturer's warranty for peace of mind. For more information on these commercial trees, please contact us at 1-888-334-7527 and ask to speak to one of our commercial tree specialists. We look forward to helping you select the tree that's right for you.